The below is excerpted from the preface; download the full statement. Governance of American colleges and universities is at a crossroads. The governing bodies of these institutions face critical challenges to methods of operation and oversight that have been in common use for decades, but which are underperforming in satisfying current stakeholders and protecting future generations. At the same time, they are under greater scrutiny than ever before, with their members increasingly held accountable for the success or failure of their institutions. These members hold a unique position with regard to stewardship of the institutions they serve, a position not shared with students, faculty, alumni, donors, regulators, or others in the community. They are fiduciaries. The concept and practice of being a fiduciary cannot and should not be reduced to a legal principle with no real-world impact on a board member’s behavior. Fiduciary principles and duties are at the heart of effective governance and AGB’s work with its members. The fiduciary duties described in this statement can seem, at first glance, to be a matter of common sense. What could be more essential for a board member than to act with good-faith and care, with loyalty to the institution, and in compliance with its mission and the law? And yet, behind nearly every failure of governance and leadership at higher education institutions is a breach of the principles of fiduciary duty. While governing boards act as a body, the fiduciary duties applied by law and best practice fall on individual board members. Each has a personal responsibility to ensure that he or she is up to the task and fulfilling his or her obligations. Effective board members must be more than names on a masthead. They must be fully engaged. They must attend meetings, read and evaluate the materials, ask questions and get answers, honor confidentiality, avoid conflicts of interest, demonstrate loyalty, understand and uphold mission, and ensure legal and ethical compliance. Those who cannot do so must step down and allow others to take their place. The success and sustainability of the institution and the protection of board members from personal liability require nothing less. 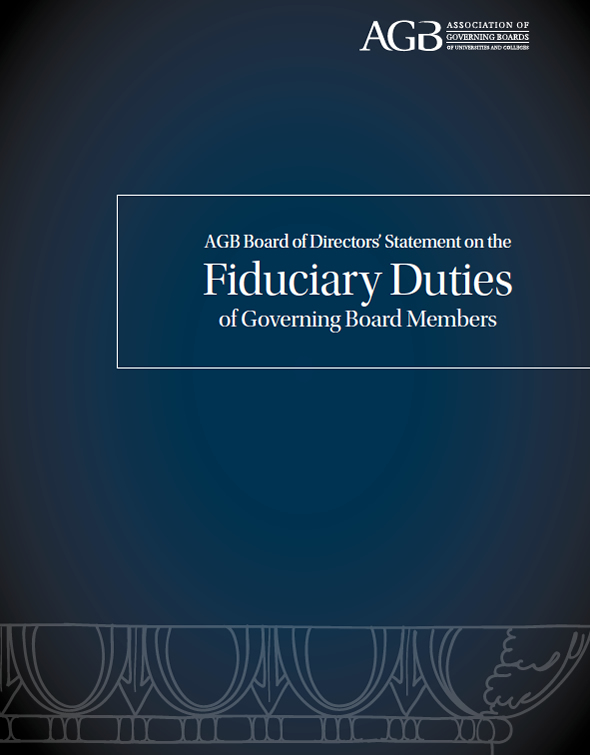 This AGB board statement is designed as a tool to orient board members to the elements of fiduciary duty and to recommend proven practices for translating those duties into effective board conduct. It comprises a discussion of governing board members and officers as fiduciaries of their institutions, an explanation of the three fiduciary duties that apply to them, and principles for translating these duties into effective board conduct. Integrated throughout the statement are illustrative questions for members of governing boards to consider.